NAMAQUA was built in 1873 by Oswald & Co. at Sunderland with a tonnage of 352grt, a length of 163ft 6in, a beam of 22ft 2in and a service speed of 9 knots. She was built for the Port Nolloth - Cape Town copper ore service and was wrecked off Port Nolloth in March 1876. 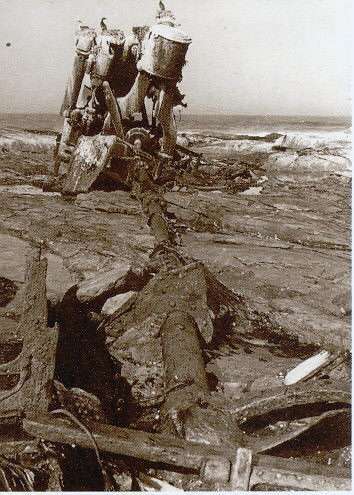 Part of Namaqua's engine and propeller shaft is all that remains of her. Another item has been added to the long list of maritime disasters to which our shores can bear witness, and the Union Line's smart little steamer Namaqua commanded by a most skilful and careful captain, has had her career suddenly terminated by one of those lamentable and untimely accidents from which no seagoing craft are exempt. The trade between Cape Town and Port Nolloth has for some time past, as most people are aware, been carried on by two steamers, both bearing the same name, but belonging to different owners - the one to the Union Company, and the other to Messrs. Jamieson and Co. Both vessels have done good service and made some smart passages in their day; in fact, on her last trip, the steamer that has now been wrecked, went from here to Port Nolloth, discharged, re-loaded, and was back again in five and a half days. She was a compact, well found little steamer, of between 200 and 300 tons burthen, and commanded by Captain Gibbs, who always proved himself a great favourite with passengers going to and fro on this route. The Namaqua left the Docks on the voyage which was fated should be her last, about two o'clock p.m. on the 28th of March, with a cargo valued at about £2,100, some £400 of which belonging to Mr. Pilkington, of Hondeklip, was, as ill luck would have it, uninsured. Mr. Dreyer, who had shipped £700 worth of merchandize, had only taken out his policy an hour or two before intelligence of the wreck was received in town, thus covering himself by a good stroke of fortune just in time. Thr cargo, we understand, was for the most part insured by the Commercial, Colonial, and Equitable office, of this city. Nothing more was heard of the steamer till Friday last, when intelligence reached town overland that she had been wrecked at three o'clock on the day following her departure, somewhere in the neighbourhood of Groene River, said to be about three hours ride from Port Nolloth, though this must have been a mistake. We should add that there were only two passengers on board, Messrs. Perkyas and Coevendon. The Union Company, without delay, resolved to send down the steamer Zulu to the scene of the wreck to render any assistance that might be required, and report generally on the state of affairs, the intelligence brought to town being, at the best, but vague and scanty. the Zulu accordingly left the docks precisely at half-past twelve on Saturday, taking about a dozen passengers, including Capt. Kerr, superintendent of the Union Company, a pilot, and a surveyor. Had the notice been longer, doubtless very many more would have availed themselves of the opportunity, as everything augured well for a most delightful trip. Even victims to sea-sickness might have contemplated it without any gloomy forebodings and uneasy misgivings that, after all the anticipated enjoyment might be unpleasantly marred by mal de mer. The sea was calm and tranquil, masses of vapour hung lazily about the mountains and it was just one of those fine sunny days when the mere physical act of breathing seems to be a luxury and pleasure. The Zulu soon shot out of the bay, and glided along coastward at a sharp pace. No one who has made this trip looks for much that is attractive or interesting, on the contrary, it is as eminently dull and monotonous from a picturesque point of view as it well could be. The coast, as seen from the sea, presents one unbroken series of low undulating hills, diversified here and there only by large patches of white sand. Occasionally one sees a farm with a limited extent of cultivated land, but the steamer, with a due regard to her safety, keeps too far out to enable one to distinguish much more than the general contour of the country. In the course of the afternoon two or three small cutters were passed, their crews looking somewhat aghast as they perceived the steamer bearing down directly upon them, the object being, if possible, to pick up any intelligence touching the wreck. Two of these crafts, thus spoken, were from Dassen Island, laden probably with penguin eggs, and the third, a small schooner from Lamberts Bay, all of course in profound ignorance as to the Namaqua's fate. Still skirting the coast, we were soon abreast of Dassen Island, and that celebrated and peculiar reef of rocks known as "The Sisters," in the locality of which it may be remembered the mail steamer Roman came into such unpleasantly close quarters some time since; and assuredly the coast here looked ugly and treacherous enough, with the breakers dashing monotonously on the low lying rocks, and at times sending spouts of water an immense height into the air. Shortly afterwards came the entrance to that magnificent natural harbour, Saldanah Bay, only dimly discernable, as the day was now fast declining, the sun going down amidst banks of gorgeous and fiery clouds, which cast a warm purple tinge on the distant hills with beautiful effect. The moon, however, soon lit up the scene again, and rarely has it been our lot more thoroughly to enjoy a night at sea. The water was almost as smooth as glass, the steamer ploughing her way through it at the rate of nine knots an hour, so that by half-past ten we were off Paternostere. The weather was so magnificent, and the moonlit ocean presented such a charming and romantic aspect, that it was with some hesitation one contemplated retirement to the restricted limits of the cabin and coffin like dimensions of one's bunk, although we must say that the berths on board are as comfortable and commodious as it is possible to make them. The following morning broke tolerably clear, but the atmosphere felt chilly and bracing, and to get an appetite for breakfast was not a task of much difficulty. The steamer now kept somewhat closer to the land, and as the day wore on, surmises and speculation became brisk as to the whereabouts and condition of the wreck. About eight o'clock, however, a dense fog settled down on sea and land, accompanied by a dismal searching rain, which gave prospect of anything but a congenial day. Groping about close to a fog bound coast in search of a wreck, however novel, is by no means the most agreeable of occupations. Soundings were taken from time to time, and only the shrill steam whistle, blown every now and then, broke the monotonous silence. As the sun's power grew stronger, the fog lifted, rifts of blue sky made their appearance, the land gradually loomed out clear and distinct from the thick vapour in which it had been shrouded, and everything was again cheerful and pleasant. A more sterile, uninviting coast all the way along it would be impossible to imagine. Not the remotest sign of any cultivation, and some stunted bushes and scrub being the only apparent indication of any vegetation. About half-past eleven, two or three white houses were sighted far away in the distance, said to indicate Groene River, the spot where the wreck was supposed to be; but, on nearer approach, these turned out to be nothing but sand patches. The coast was now closely scanned for any signs of the derelict steamer, but even the concentrated force of half a dozen binoculars failed to bring anything to light, and the reckoning at noon showed the Zulu's position to be still about eighteen miles to the southward of Groene River, so that she has not made quite such good progress as was anticipated. Time went on, still no signs of the wreck, and suggestions were even mooted, by way of diversion, that after all it might turn out a sell, the more so as it transpired that Mr. Pilkington's son, who sent the news on to town, had received it on the 1st. of April. All such ideas, however, were dispelled shortly after one o'clock, when the masts of the truant Namaqua were seen far away in the distance, much to the delight of everyone on board. A signal flag was at once hoisted, hawsers and other gear got in readiness, and by half-past two o'clock the Zulu had got up to the wreck, going as close as it was consistent with safety. The precise spot where the wreck lies is Island Point, or Mozell Island, about 180 miles from Table Bay, and forty or so, south of Hondaklip, latitude 31 20 south; longitude 17 53 east. A whale boat was speedily lowered, and pilot (Mr. MacMillan) and second officer landed. The Namaqua as seen from the sea was high and dry lying broadside on to the shore across a ridge of rocks stretching out from the main land some five hundred yards or more. She was completely cradled and wedged in, the sea breaking upon her from the westward. Her position was perfectly upright, but though high water at the time; the propeller and keel could be seen distinctly, and it was almost inconceivable how she could have got piled up on to such a berth. It was impossible to tell what actual amount of damage she had sustained, but it was evidently very considerable. One of her boats lay alongside on the reef, bottom upwards, and another could be distinguished on the shore. Not a soul was on board; nor was any flag or signal to be seen, but several tents had been rigged up on the mainland, and a number of persons for the most part natives, could plainly be seen on the beach running about and gesticulating. A landing was effected with no small difficulty owing to the heavy surf, but the whale boat had been absent much more than twenty minutes before another thick fog came treacherously creeping up from the westward; and a signal was thereupon made for the landing party to return forthwith. They came back, however, as they went, without either the captain or the crew, who it seems had proceeded on to Hondeklip overland, and were to leave for Cape Town that very morning, in the schooner Luna. Owing to the short time allowed on shore, the information that could be gleaned was necessarily but very scanty; and nothing is known as to the circumstances of the catastrophe, or to what cause it is attributable. The wreck had been abandoned, and sold by the Resident Magistrate for the absurd sum of "five pounds", the purchasers being Messrs. Lageson and Pilkington jointly, who had also arranged to land the cargo for the benefit of the underwriters. They had, however, only been able to commence operations the same day that the Zulu arrived, and but a small quantity had been landed. There were no custom house authorities in charge, and to all appearences everything was pretty much at the mercy of those who happened to be on the spot. The pilot for instance, who went ashore, reported that liquor appeared to be flying about pretty freely, and we have no doubt that those congregated on the beach would not fail to make good havoc with flotsam and jetsam that came their way. A good deal of linen, bedding, and other appurtenances belonging to the ship had been got ashore, and there was no question that the purchasers had made a tolerably good bargain; in fact, it seems hardly credible that they bought the wreck for five pounds, although it was absolutely so stated by the only available authority. As the steamer lies there would seem to be no very great trouble or difficulty in landing the cargo and saving a great portion of the ship's belongings for the ship is not more than 350 yards from the mainland, and it will take a long time before she is dislodged from the staunch position she occupies. Any attempt to remove her, it was at once seen, would be utterly hopeless. We believe it was stated that the engines had already gone through her bottom, but this, the pilot, who went ashore seems very much to question. The boat reached the ship again none too soon, for the fog had by this time again completely obscured everything with a thick darkness that might almost be felt. The captain and crew having left, the wreck sold, and cargo in the hands of the underwriters, nothing more remained to be done, and accordingly the Zulu was put about, and resumed her homeward course, Captain Travers judiciously keeping her well out from the land. There is no question about the dangerous and unpleasant nature of navigation between Table Bay and Port Nolloth, owing to these thick fogs, which, with hardly any warning overspread everything, and there is but little doubt that under some such circumstances, the Namaqua came to grief. The scene of the wreck was left shortly after three o'clock, p.m. on Sunday, after a pleasant run of twenty-nine hours, during which nothing noteworthy occurred, the Zulu was again safely in dock shortly after eight o'clock last evening. Nothing more definite will be known about the wreck until the arrival of the post from Namaqualand next Friday, unless the Luna, with Captain Gibbs and the crew, should happen to come in before, which is very improbable. REPORT of a Court of Inquiry into the loss of the Steamship "NAMAQUA" at Port Nolloth on the 31st May 1889, held at Port Nolloth, in the Division of Namaqualand, this 10th day of June 1889, before me, CHARLES DAVID EBDEN BELL, Resident Magistrate, and Captain TYSON, of the Steamship "Saxon," Nautical Assessor. The steamship "Namaqua," of Cape Town, 116 tons, while proceeding up the channel from the inner bar anchorage to her usual moorings at the southward of the Port Nolloth jetty, with the assistance of the licensed pilot, Quesnell, that owing to an unusually strong current took a sheer to starboard at a particularly narrow part of the channel, to the north end of the reef opposite the Yankee John Rock, the helm being put hard-a-starboard. The tug still towing ahead failed to straighten the ship, and she grated over a reef, causing her to leak so rapidly that she had to be immediately beached. The Court finds no blame attaches itself to the master, whose certificate is returned. (Signed) CHARLES D. E. BELL, R.M. Port Nolloth, 11th June 1889. What makes researching the "Namaqua" difficult is that there were two ships of the same name trading between Cape Town and the West Coast at the same time. The large picture states that the ship portrayed is “Berry’s Coaster”. Judging by her appearance I think the narrative is in error and she is in fact Union Line’s vessel. The small picture is of the other Namaqua. Given that her trade was to carry copper then the design of the ship in the large picture would lend itself to that purpose far better than the vessel in the small picture. Union Line's Namaqua had a good reputation for speedy voyages, but like so many ships on the coast, came to an untimely end, the victim of the notorious West Coast fogs. The same intrepid reporter would, six months later, make a similar 'on the spot' report upon the loss of Castle Line's "Windsor Castle" not many miles away to the south. As with that report never could our reporter be accused of parsimony with words, one cannot but help feel the editor found filling his newspaper at times difficult, but the report from the 'Cape Argus' is of great value and interest, in its immediacy, description of Cape weather and what it was actually like sailing on these early coastal steamers. The reporter was given passage on the Union Line's "Zulu", this is his first hand story.